MHC stands for Major Histocompatibility Complex; it is the region in the genes responsible for transplantation antigens, which are involved in shielding the body from pathogens. Image 1: MHC Class I protein. The cells in the body, almost all of them contains MHC class I. it presents endogenous antigens from the cytoplasm. These include self-proteins as well as proteins (foreign) produced inside the cell. Once the proteins degrade, the fragments of the peptide are moved to the endoplasmic reticulum and bind to MHC I proteins. After which, they will be transported to the cell’s surface. Once they reach the surface of the cell, the MHC I protein will display an antigen to be recognized by cytotoxic T cell lymphocyte, which is a special immune cell. Image 2: MHC Class II Protein. Macrophages – They engulf foreign bodies like harmful bacteria. Dendritic cells – They are antigen present in T cells. B cells – They produce antibodies. Once the pathogenic organism is encountered, the protein from the pathogen degrades into fragments of the peptide by antigen-presenting cells and these fragments will be sequestered into endosome and bind to MHC II proteins. After which, it will be transported to the surface of the cells. Once it reaches the cell’s surface, MHC II proteins will display the antigen to be acknowledged by T cell lymphocyte. T cell lymphocytes are helper cells and they are activated once bind to dendritic cell MHC II antigen and/or macrophage which will result in the production of lymphokines. This is a special class composed of diverse complement components of genes such as Bf, C2, and C4. These are found in between class I and Class II genes and later on grouped as MHC class III. Image 3: A comparison image between MHC Class I and MHC Class II. Image 4: Major histocompatibility complex class I and II difference. They are both MHC molecules encoded by clusters of MHC genes. They are both surface antigens expressed on the membrane of the cell. They are both antigens found on T cells. They are both involved in eliciting immune responses to fight foreign antigens. 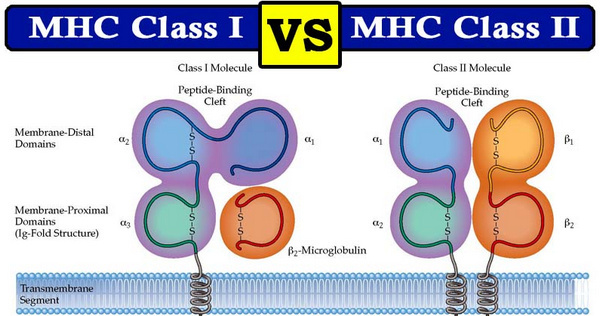 Image 5: The image shows the differences between MHC Class I and MHC Class II. What are the differences between MHC Class I and MHC Class II? MHC Class I – They are present on the surface of nucleated cells such as the cells in mammals. MHC Class II – They are present on antigen presenting cells like B cells, dendritic cells, and macrophages. MHC Class I – They are found on all nucleated cell types in the body. MHC Class I – They consist of 3 alpha domains and 1 beta domain. 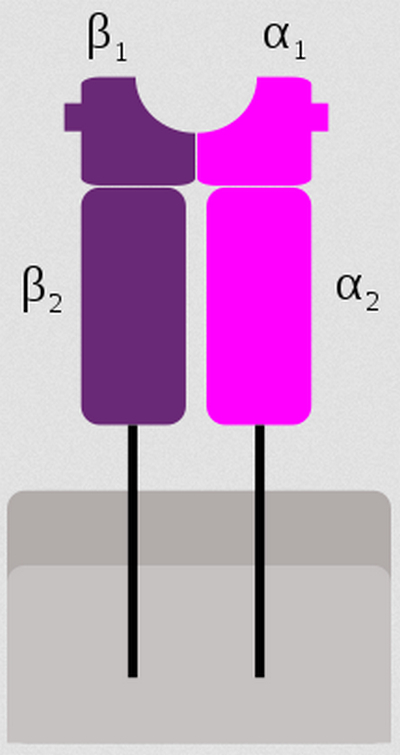 MHC Class II – They consist of 2 alpha and beta domains. 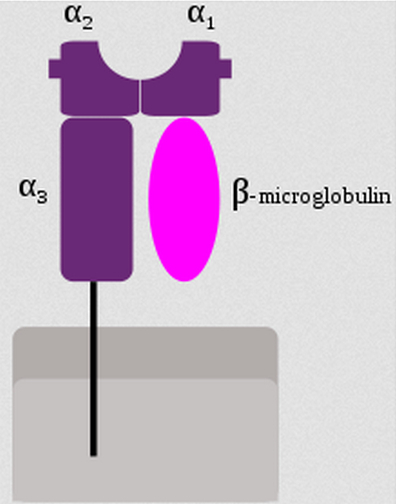 MHC Class I – Their main role is to clear endogenous antigens. MHC Class I – There are three: MHC-A, MHC-B, and MHC-C.
MHC Class II – MHC-D.
MHC Class I – They have a single membrane-spanning alpha and beta domains. 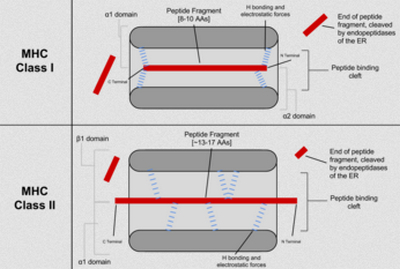 MHC Class I – Both alpha 1 and 2 domains have something to do with the presentation of antigens in the molecules of MHC class I.
MHC Class I – Alpha domains are found on the LHC locus of chromosome 6. On the other hand, beta chains are found on chromosome 15. MHC Class II – They are found on chromosome 6. MHC Class I – Present antigens to cytotoxic T cells. 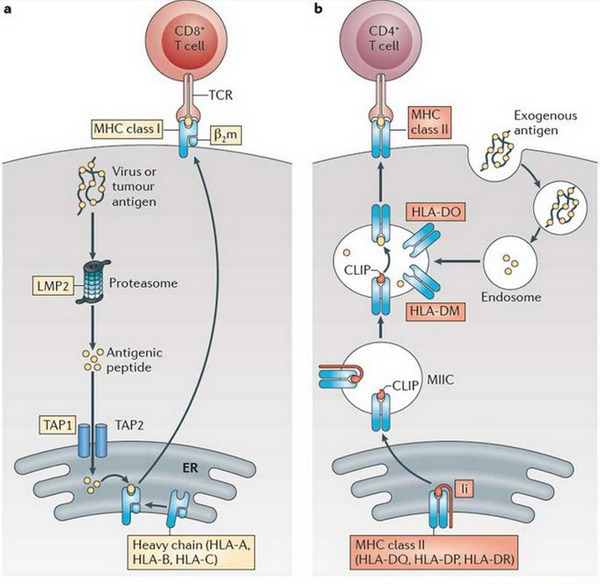 MHC Class II – Present antigens to helper T cells. MHC Class I – They have endogenous antigens that came from the cytoplasm. MHC Class I – They bind to CD8+ receptors on the cytotoxic T cells. MHC Class II – They bind to CD4+ receptors on the helper T cells. Occurrence Nucleated cell types in the body Antigen-presenting cells like macrophages, dendritic cells, and B cells. Nature of presenting antigen Endogenous antigens that derived from the cytoplasm. Exogenous antigens that came extracellularly from foreign organisms. Antigen-presenting Domains Alpha 1 and 2 are involved in presentation of antigens in the molecules of MHC class I. Alpha 1 and beta 2 domains are involved in the presentation of antigen in MHC Class II molecules. Responsive cells Present antigens to cytotoxic T cells. Present antigens to helper T cells.